National Institute of Mass Communication Bangladesh Job Circular 2019 has been published recently. This job circular at NIMC is giving opportunity to the job seekers who are trying to get a good government job. NIMC Job Circular 2019. If you think you are qualified for the job post at National Institute of Mass Communication, then apply as early as possible. But you must have the required qualification and demands for the job. 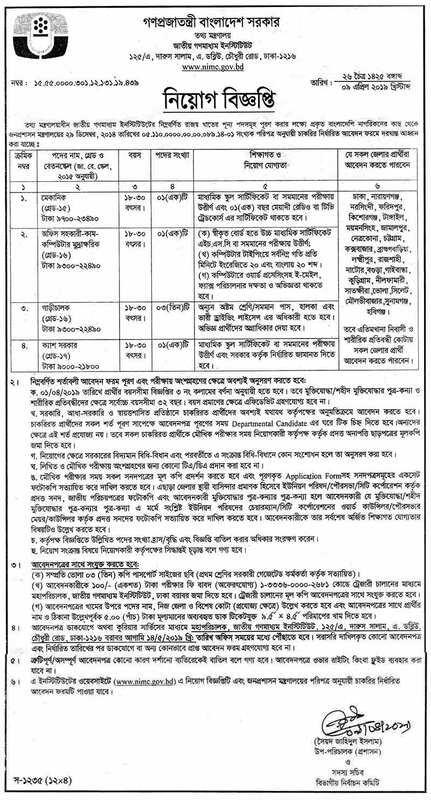 Don’t miss the chance to apply for the NIMC Job Circular 2019. www.nimc.gov.bd. National Institute of Mass Communication (NIMC) is one of the leading training Institutes of the country under the Ministry of Information. Established in 1980 as the National Broadcasting Academy, its name was changed to National Institute of Mass Communication in 1984 by the government following the report of the Martial Law Committee on reorganization of set up phase-II. It is the apex training institute under the Ministry of Information for professional training of officials under its various attached departments, and also for freelancers, personnel working in Private Radio, Television and Film Media. NIMC is located at 125/A, A. W. Chowdhury Road, Darus Salam, Dhaka-1216. It is housed in a five storied building and a lift has also been installed. It stands at the north eastern side of Mirpur Road, adjacent to Housing & Building Research Institute and Low Power Transmission Centre of Bangladesh Betar. The building is unique in the sense that it is far from the crowded city centre and located in a calm and quiet atmosphere. The training complex, dormitory and the staff quarters are located in an area of 2.55 acres of land. Salary: See the image circular.